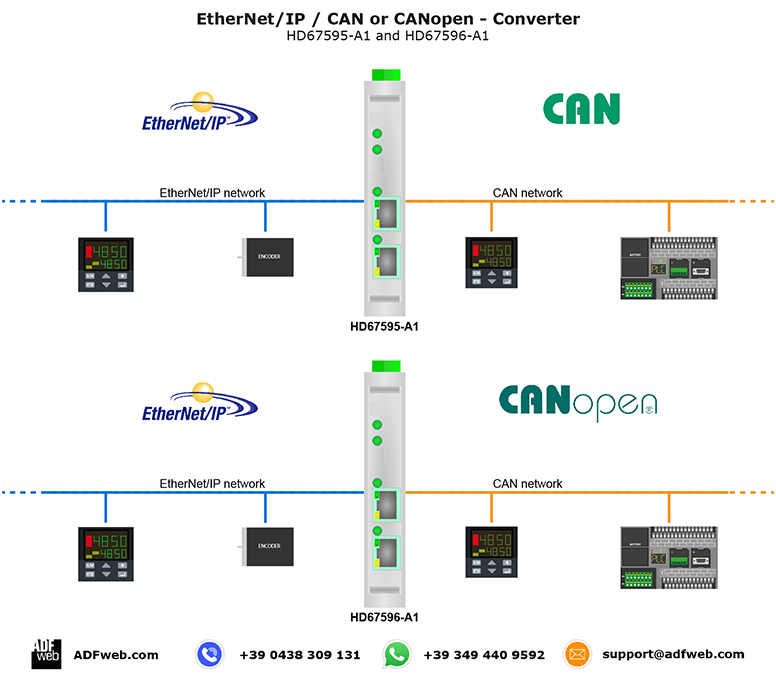 This serie of products allows to integrate an EtherNet/IP network with a CAN net. The HD67595 is a EtherNetIP / CAN Converter and it allows you to connect some CAN devices with an EtherNetIP net (for example an Allen Bradley PLC...) in order to exchange the informations between the networks. The HD67596 is a EtherNetIP / CANopen Converter and it allows you to connect some CANopen devices with an EtherNetIP net (for example an Allen Bradley PLC...) in order to exchange the informations between the networks. The HD67645 is a EtherNetIP Master / CAN Converter and it allows you to connect some CAN devices with some EtherNetIP devices (for example Encoder, I/O...) in order to exchange the informations between the networks. The HD67646 is a EtherNetIP Master / CANopen Converter and it allows you to connect some CANopen devices with some EtherNetIP devices (for example Encoder, I/O...) in order to exchange the informations between the networks.